We suspect these bankers will need to feel some pressure on to take Bill up on his offer. If you think the CEOs of Goldman Sachs, Barclays, RBS and HSBC could do with a reality check we’ve set up a nice little system that allows you to ask them. We will be updating the CEOs to let them know how many people want them to go. We have a month - lets make it count. The big question is, though, who would you most like to see riding round the globe with Bill? It doesn’t have to be this way. A Robin Hood Tax of just 0.05% on every financial transaction, or 50p in every 1000 pounds traded, could raise 250 billion pounds globally and 20 billion pounds here in the UK. According to the Bank of England, the banks benefit from our taxes and the subsidy afforded them by the UK government, to the tune of 100 billion pounds every year. The IMF is clear that a Robin Hood Tax will not fall on any ordinary people, but only on the successful gamblers who take their risks in the most rarefied of financial atmospheres, who deal in such huge amounts of money that they can effortlessly afford such a tax. This is a tax on the crazy casino that sees billions traded each day. The crazy casino that led us to the edge of chaos just two years ago, and has left our economy on its knees. The British have a sense of fairness that is legendary, and has been stretched to the limits by the continued spectacle of huge pay increases and bonuses while ordinary people suffer. If there has been any atonement it has escaped my notice. The Robin Hood Tax is not simply a good idea because it allows the banks an opportunity to atone for their recklessness. It was always a brilliant idea. But it is true it offers an alternative to making the British public pay, whether through VAT increases, cuts in health services and schools, libraries closing or severe cuts in the World Service, one of the great ways the British nation has communicated with the world for decades. All these would be rendered immediately unnecessary if the speculative gambling that takes place in cyberspace were minimally taxed. Charity would effectively be institutionalised. Domestic issues such as child poverty in the UK, benefit traps, looking after disabled children would be taken care of and we would be able to continue our exemplary record in fulfilling our promises to the poorest in the world, like our commitment to stopping 500,000 women dying each year trying to have a baby. 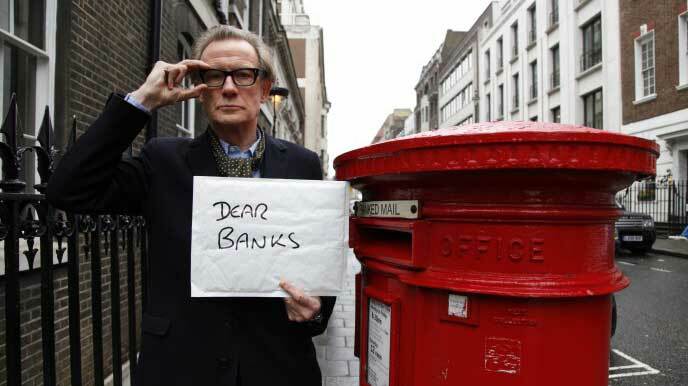 I want to use this letter to issue a challenge to the heads of the major banks. Come with me to see the impact of crushing poverty on poor people in the UK, on those who will lose the Disability Living Allowance, on those made homeless and jobless or those struggling to pay their heating bills. Come with me to see the impacts on the poorest people in the world. To see the slum of Dandora, outside Nairobi where little girls live brutalised lives in a perfect hell, competing with rats for scraps of rancid food. Where just 150 pounds could save them and bring them to a place of safety. Come and see this and explain to me why you don’t support a Robin Hood Tax. I want to challenge the government too. It doesn’t have to be this way. Polls show that more than three quarters of those who voted for the coalition government also support more taxation on the banks (75% conservatives, 87% Lib Dems). This would be the most popular tax in history. I personally invite the heads of all the major banks to come with me, first to see examples of where the cuts have most hit people in Britain, and second to come with me to Dandora, to see the children and see how they live. Let’s take a trip, you and I and get things in proportion. Will you come? The deadline to respond is Friday 25thMarch. Trips will take place during Summer 2011 on a mutually convenient date. Next : Will MEPs Support A Robin Hood Tax?